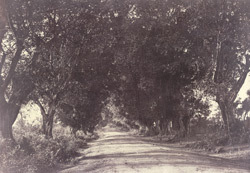 This photograph of an avenue of was taken by Linnaeus Tripe (1822-1902) in 1858 and published in an album entitled 'Photographic Views of Ryakotta and other places, in the Salem District...with descriptive notes, by J.A.C. Boswell, Esq., M.C.S.' (Madras, 1858). Descriptive notes accompanying the album read, 'In planting avenues along the sides of the public roads we have followed the example of our Muhammedan predecessors when they held the country...' The precise location of the scene is unidentified. Tripe was in charge of one of the battalions of the 12th Madras Native Infantry, a regiment funded in 1824 and stationed in Madras. In 1855, Tripe was commissioned to take photographs for the British East India Company and the Madras Presidency which resulted in six albums, one of which was of Ryakotta.